Last week in Show & Tell, Jeziel was toying with the idea of becoming a vegan. (Now that’s a whole different conversation) but Mel recently discovered that vegans can use chickpea juice (or aquafaba) instead of egg whites! After questioning how tasty this would be, Mel decided that she would have to find a vegan recipe that included aquafaba and put it to the test. That night she stumbled across Short St. Kitchen’s vegan chocolate mousse recipe, whipped it up (and we mean really whipped it, apparently it took a few minutes to whip the chickpea juice) and brought it into the studio. It was delicious!! Everyone who tried it couldn’t tell the difference between that and regular chocolate mousse. Check out the recipe below if you’d like to give it a go yourself. Whiz up dates, cacao powder, coconut oil and maple syrup, salt and vanilla in a food processor or blender until very smooth. Add the coconut and blend up until smooth. Of using coconut cream, make sure it has been in the fridge for at least 12 hours. Carefully open the tin without shaking it and scoop out the firm half od the coconut cream to use. You can freeze the rest for later use. 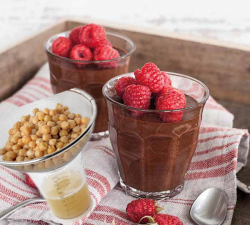 Drain chickpeas, reserving the aquafaba. Using the electric beater whisk until stiff peaks form and it resembles egg whites. Start folding 1/2 aquafaba through the chocolate mix, to begin with, and add more to achieve the texture you like. Poor into small jars and refrigerate until set.